The discussion follows a recommendation by the school board that city residents be asked whether they want to remove a city charter rule that requires the superintendent to live in the city. AUGUSTA — A controversial proposal to remove a city charter rule that requires the school superintendent to live in Augusta advances to city councilors Thursday. School board members voted Jan. 8 to ask voters, in a citywide referendum, to remove the superintendent residency requirement. Board members said requiring the superintendent to live in the city has been an impediment to hiring the best-qualified candidate for the superintendent’s job. Now it’s up to councilors to decide whether to act on the school board’s request to send this issue to voters in a November referendum. Changing the charter requires a citywide vote and voter turnout of at least 30 percent of the number of people who voted in the 2010 gubernatorial election. School board members have expressed concern they wouldn’t get a large enough turnout in the June primaries, so they’re targeting the November general election. Last year the school board voted to extend the term of Superintendent James Anastasio, the former principal of Cony High School first hired as interim superintendent in January 2013, until June 2015. Board members said they want to remove the residency requirement not specifically to hire Anastasio as superintendent — though ultimately he could be selected for the job. 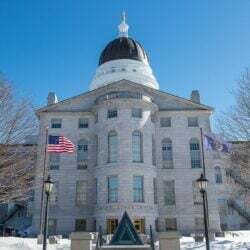 Rather, they said, only a handful of school districts in Maine require superintendents to live in their districts, and the requirement has hindered Augusta’s efforts to attract highly qualified applicants. “In recent years the availability of highly qualified candidates for superintendent of schools has become scarcer, and the school committee believes that the residency requirement is an impediment now, and will be in the future, for hiring the best qualified superintendent of schools,” school committee members wrote in their request to the council. Legislation that would have allowed local school boards to override superintendent residency requirements was vetoed by Gov. Paul LePage last year. At their meeting Thursday, Councilors are scheduled to discuss the board’s request to send the proposal to voters. They’re likely to vote on the proposal at a business meeting in two weeks, according to City Manager William Bridgeo. Councilors are scheduled to meet in council chambers at Augusta City Center at 5:30 p.m., which is earlier than normal because last week’s council informational meeting was canceled because of snow. â¢ hear an update on the warming shelter.